I really don’t know how to explain this one. So let’s try this on for size to start with: I suppose this is an example of what happens when a new style of music comes along and those unaccustomed to it find it rather shocking and without much artistic merit. If they then decide to join in, for a lark or out of commercial desperation, they really have no idea of what components go into it, what makes the good records in that milieu WORK, since they may not personally feel that they in fact DO work, other than in attracting an obviously wayward, possibly degenerate and certainly tasteless audience. So instead they seize upon the most obvious and extreme aspects they see and in an effort to go along with the trends of the day they cynically attempt to exploit it, perhaps mock it, or… well… murder it. Yeah, I guess that sums this one up okay. Like so many others who’d made their name singing refined material but hadn’t quite hit the big time with it The Velvetones from Newark, New Jersey were forced to confront the growing demand for the new rock style that called for risqué lyrics with more rhythmic backing. They weren’t quite suited for this however as we’ll soon find out. The earlier part of the decade certainly wasn’t inhospitable to black vocal groups, as those like The Ink Spots were huge commercial successes appealing to both black and white listeners in a more refined pop style. As always when something is popular others follow… like The Velvetones. They were apparently a pretty decent club attraction when they were signed by Decca Records in 1945, one of the major labels no less, surely seeking another Ink Spots, in case the originals ran dry or something I suppose. Nothing The Velvetones cut was deemed suitable for release though and so jettisoned from the label they wound up on a small independent called Cornet where all of their sides from one session were put out at once, in March of ’46. Never a good idea to flood to the market, especially with an unknown entity (as Moby Grape fans will surely attest once we get to 1967 here on Spontaneous Lunacy… make your reservations today!) and not surprisingly none of The Velvetones sides connected with audiences. They then landed at Sonora Records where their track record at selling virtually no copies of their releases remained intact. If nothing else at least they were consistent in their commercial failures. They subsequently changed personnel but it didn’t help to turn the tide. In a matter of three years they had quickly gone from promising up and comers to disappointing has-beens without benefit of ever stopping on successful commercial artists for so much as a minute. They weren’t without talent but their records were pretty straightforward harmony songs and the market for that, outside of a few big names, was rough to break into. They showed a definite Ink Spot influence, more attuned with pop tastes, but they also released some novelty material that seemed to be trying for a different audience altogether. The reviews of all of their records were pretty bad, but then again, in the mid-1940’s the writers at Billboard magazine were pretty bad themselves, particularly when it came to understanding and appreciating black music. In any event, The Velvetones were headed nowhere fast when they scored this lone release on the small Super Disc label which pretty much gives you an indication of its ensuing commercial response. Heading into the session they were clearly at a crossroads. The Velvetones obvious debt to The Ink Spots hadn’t gotten them anywhere but in the door, and barely at that. Once inside they found no takers for what they were putting out and were about to be shown the door themselves unless they could stir up a little action somehow. Their failures thus far probably made little sense to them on the surface, they were good singers after all, the material wasn’t awful, the production values were okay, maybe the promotional push was lacking but what independent label artist wouldn’t say the same thing at the time? So when they snagged this one more chance – maybe one LAST chance – they had two choices. They could keep heading down the same path, changing nothing and hoping that it somehow would meet with a better response, as unlikely as that possibility was, or they could try another avenue altogether. After all if what you’re doing is failing it’s not as if doing something else can fail any worse. So The Velvetones tried something different. Intentionally over the top or just blissfully unaware of their offensiveness, Roberta, Get Out Of That Bed is a fascinating archival example of the fine art of musical misogyny. Anyone placing the blame for that trend squarely on more recent forms of rock, from hip-hop to punk, need to take a listen to this doozy. Essentially this is the story… or is it confession?… of a seemingly mild-mannered fellow who, shall we say, gets a trifle perturbed that his wife is lounging around all day when he’s out working hard to bring home the bacon and consequently, as casual as can be, recounts how in response to such an affront he quite naturally proceeded to bludgeon her to death with a stick! In some ways this almost sounds like a rock ‘n’ roll farce done for the amusement of the others in the group. Something they were fooling around with after hours and wound up cutting it in an off-the-cuff version just for laughs. To start with there’s not much of an arrangement here. For the first half there’s just two voices heard, a brief talking intro between them to set it up, then one of them singing accompanied by just a piano, detailing how he went from pleading with her to get up… to threatening her… to inflicting blunt force trauma to her cranium… all in a routine, matter-of-fact fashion, like he was recounting how he grew tomato plants in the yard last summer or painted the garage door over the weekend. Ho-hum. The others join in for the “chorus”, harmonizing on their farewell to the poor deceased girl (By-ye, Bye, Roberta ! ), like she was going on a cruise or was off to see her aunt in Sheboygan rather than being carted off to the mortuary with her skull caved in. You half expect to hear the rest of them start to crack up in the background midway through, maybe telling the lead singer to knock it off and get serious so they can get down to cutting the REAL song they were supposed to do on the session. It HAS to be a joke, you’re thinking. But no, they play it completely straight throughout. There’s no humor, no laughter, no winking at the audience to let them know they aren’t serious, no sense at all that this actually was a goof. Now to be fair, despite the actual homicide itself there’s really no maliciousness in it at all if that’s possible. He’s not coming off as angry and deranged, though that could be a sign he’s truly psychotic I suppose, I’m a rock historian not a licensed psychiatrist after all, so I’ll leave that assessment to others more qualified in dealing with the motives of homicidal maniacs. But it’s a fairly mild musical murder if that’s any consolation. Despite its poor taste one can certainly envision how the group, frustrated with their lack of success with a more straightforward pop style and sensing a loosening of the moral rigidness with this rock something or other coming into vogue, and maybe taking their cue (missing their cue is more like it) from The Trenier Twins who were building a decent nightclub career on humorous skits set to a steady rhythm, thought this might do the trick for them. If you want to ignore the lyrics you might even be right to say it’s not sung badly. The melody, though fairly innocuous, is somewhat catchy even. It’s just that the content and the delivery that reduces the “humor” (????) 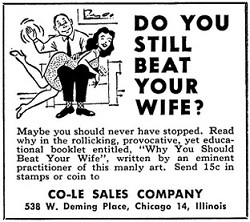 to the shock value of the first punch-line makes it bewildering. Even if you don’t find the death of a fictitious character distasteful you certainly should be offended that it’s done without any creativity, which in rock is always the bigger sin than any moral deficiencies. But since it IS lacking any real wit then all that’s left to focus on is the content and the mindset behind it that believed even for a moment that this might actually connect with an audience. To be honest I don’t think they contemplated the moral implications of what they were singing. 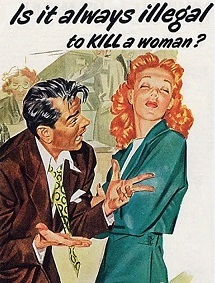 They weren’t really killers after all, they were just exaggerating a common complaint men shared with each other, figuring it’d find a sympathetic ear. 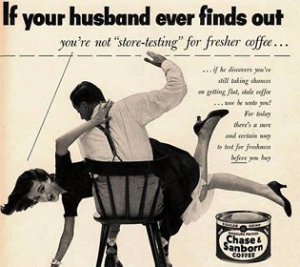 Times were different then and while assault with a deadly weapon was presumably still a crime in most states, they seem to have taken a fairly reasonable premise – marital annoyance over a lazy spouse – and just raised it to questionable, if not indictable levels. But that’s no consolation to the innocent victims in this sordid mess, namely Roberta and the poor unfortunate listener who was forced to sit through such an ordeal. It’s not funny enough to overcome its utter lack of any musical merit and it’s not musical enough to overcome its disturbing lack of humor. If there’s a happy ending to be found I suppose it’s that justice was ultimately served as The Velvetones promptly got booked for their heinous crimes against music and were found guilty of felonious – and melodious – assault. By the time they got out of the slammer rock music was too well established to give the parolees another chance. 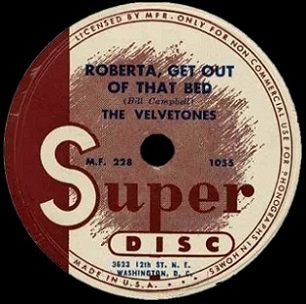 Leave a reply on "The Velvetones: “Roberta, Get Out Of That Bed”"